Yet he has these kind of numbers in National Polls**? give me a friggin' break! **This is from http://www.cbsnews.com/stories/2005/01/19/opinion/polls... and I did move one line over. There are MORE questions represented here. 1. That's because Bush supporters refuse to give their opinion. They love their pResident, but don't want anyone to know it. and Dem filibustering and mass protests and whatever else it takes until this illegal regime ( and its propaganda branches in MSM ) are finally outed and sent to the World Court to be tried for terrorist acts, international war-crimes and two treasonous coups against the America people. Not to mention the 3 million STOLEN votes, flipped from Kerry to *. 4. Anyone Hear Juan Williams on Morning Edition Today with Rove? That was the most annoying interview ever. He kept saying polls don't really mean anything, and then quoting polls. 6. So many odd things like this. To me, it seems painfully obvious that this election was illegitimate. How do the pundits keep a straight face when they peddle their BS 24/7. I could almost laugh at it if I could stop mourning the death of democracy. Yes, I heard part of it. Selective use of facts to justify Bush's political weight, like the highest Presidential vote ever, when all of us know (but not the Fox news listener) that Kerry got the second highest vote. Both figures, which anyone with any intelligence would find marginally impressive since 1) the population continues to grow every election cycle 2)The extreme polarization of the political parties kept people from voting in any significant numbers for third party candidates. "Machiavelli wrote of a governor who was having trouble with civil unrest. He hired muscle to squash the disorder, and after, when the public became very unhappy with the gov't because of the hired gun, the governor had the guy slaughtered in a public square to show that it was the enforcer's actions, and not the interest of the gov't. Kind like how Osama, Saddam and Noreaga were all once basically CIA employees." 8. "Highest Presidential vote ever"? Bush was re-elected by the smallest margin in 100 years of those presidents who won a second term. 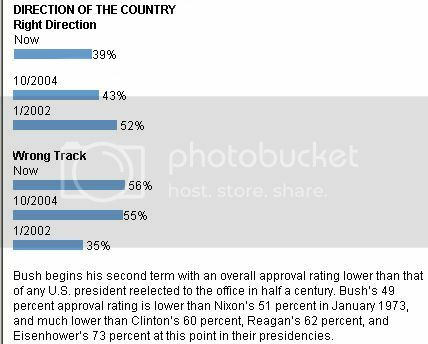 His approval ratings this week are the lowest ever plumbed by any president at the date of his inauguration. (as written by the UK Guardian). And for every poll Rove can produce showing people want Social Security "reform" I can produce one that shows they DON'T. Why did Juan let him get away with this? Doesn't he know the facts? Or was he scared of the big, bad KKKarl? spouted the "popular" vote and that polls weren't worth while, and brushed him off again. But the election only sampled those who turned out, and managed to cast a vote. That explains the difference between the election and opinion polls about Bush. If the pollster were to put Democrats on hold for several hours before querying them, perhaps then the opinion poll would match the election result.